Just to be completely fair, Fultz was considered easily the #1 pick in that draft, on a tier by himself, by almost every draft evaluator that publishes their evaluations. Bodner had six or seven guys on his podcast, and there wasn't a single one who didn't have Fultz #1, most of them easily better than Ball, Jackson, Tatum, Fox, and Isaac, who were generally considered the next "tier". Mitchell was evaluated in the mid-to-late lottery. Who knows how much truth there even is to that Celtics stuff, it's easy for them to leak that now. Most likely they were never going to take Fultz because he didn't fill their positional need. Certainly the Sixers missed some things about him, but nearly every team still would have taken him (also true of Noel and Okafor. We'd also be unhappy if they'd gotten Wiggins. Or if Embiid had already gone the way of Oden). They are by no means blameless but it has turned into a pretty freakish combination of physical and psychological circumstances. Both parties looking pretty dysfunctional. And of course the agent is denying it. What he actually denied was requesting a trade, which is not the same thing as the player wanting out. Hard to see how it ends any other way really but that was already true once they got Butler. Question is how and when can they get anything for him if he can't play or they don't want to play him. The situation is 13 months long and could wind up ending the second-year guard's career with the 76ers. Not much new here though it seems Pompey has his own "multiple sources." They are going to have to trade him. He will not get the opportunity to improve the rest of the season, and they have to make a decision on exercising his option at the beginning of next year anyway which unless he improved significantly is hard to imagine. Moreover, His salary is over $9 million next year – if they get rid of that then they will have enough for another Max player over the summer even with Butler’s cap hold. A chance at Durant, Kawahi, Middleton, etc. is unfortunately worth more than Markelle at this point. Dominant win for the sixers last night. Kind of bummed Korver got traded elsewhere but he may have not been the piece they needed with Shamet showing he can shoot from the outside. If they are going to trade for someone, Trevor Ariza is the best fit, but he can't be traded until the middle of December by league rules because he just signed this offseason. Besides Shamut, Korkmaz is looking better too. The Suns send Josh Jackson and Trevor Ariza to the Wizards The Wizards then waive Ariza. The 76ers send Fultz and Korkmaz to The Suns. The 76ers send Wilson Chandler, their first round pick plus the 2021 unprotected 1st rounder they got from the Suns to the Wizards. The Wizards send Beal to the 76ers. The 76ers then sign the waived Ariza (it would be an under the table agreement). Suns get two young players and get our of Ariza's salary. The Wizards, get a young SF, Chandler (who's contract runs out at the end of the year) and two first round picks. The 76ers would end up with Beal and Ariza essentially for Fultz, Korkmaz and Chandler. That would make them the favorites in the East and a legit championship contender. I ask because I really don’t know...is that Beal scenario remotely realistic? Probably not, those kind of trades are rare, I just put that together out of thin air., more of a wish than anything else. Obviously as a Sixers fan, the trade is probably not realistically feasible. I didn't even research the contracts to see if the money would work. I don't think it is that unusual for TOC to go undiagnosed. Nor does everyone play through it. Some have retired because of it. Which is not to say the "nonsense on stilts" theory isn't also credible. Several "internet doctors" had speculated months ago on this exact malady, and it made sense then although the diagnosis was at such a distance fans were necessarily skeptical. If this is correct, it is fixable. But if true hugely embarrassing to the Sixers medical staff. I will say that I know the Sixers shoulder guy and at least for regular way shoulder injuries, the best around. Should he have figured this out (if true)? No idea. Certainly not a regular way shoulder injury. 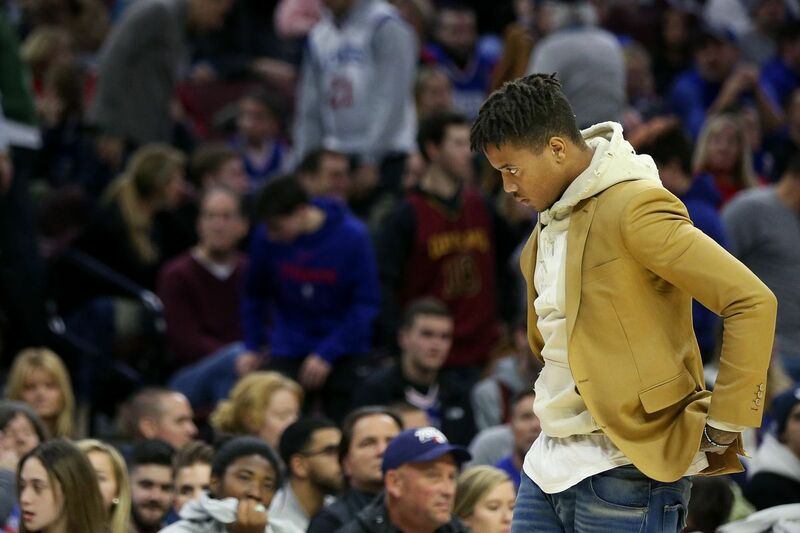 Honestly, Fultz should rehab for 6 weeks, then go down to the D-League and rediscover his game. Out of the spotlight and away from the NBA glare. I believe that the degree of skepticism regarding the latest and hopefully final diagnosis of Markelle Fultz's injury is unfair. It is unfair to the player, the Sixer's doctors and advisors and to Sixer's Phans who should not be fed amateur diagnoses by commentators and self-proclaimed media experts who are neither inside Markelle's body nor his head and who seem to have had no prior experience with athletic injuries. I am a tennis coach. I had hit 100,000s of serves and eventually tore my rotator cuff. Over 4 hours of surgery to repair. A year later, I was back hitting thousands of serves. Andrew Luck missed all of 2017 with a shoulder injury that began two years prior. He made his successful return in 2018. No one questioned his mental state or integrity. He hurt it, as I did, by overuse. Pitchers regularly throw too hard or too often and require Tommy John Surgery. Only they know how badly they are hurt and how it influences their ability to throw curve balls and sliders. Markelle has wanted to be in the NBA all his life! He practiced 100,000s of 3 pointers and eventually damaged his shoulder. Because it was finally diagnosed as TOS. it makes sense that it carried down the arm to his wrist. It wasn't due to his mental condition, as "experts" all over the local and National dials have pontificated. It was because he practiced too much and suffered from "wear and tear". He overworked it, just like I did and Andrew Luck did and pitchers all over America have done. He is 20 years old. I have sneakers older than him. He is hurt, trying to please everybody and, no doubt, confused, by all the attention and criticism. He needs time off to get this problem repaired by whatever it takes and then, finally, the Sixers will have one hellava basketball player! Turnovers and rebounding again major issues in a big game. Game was more competitive than last meeting, and Butler was sensational. Unfortunately, Kawhi was just as sensational and probably more so on account of his shutting down Simmons. The Raptors' bench is deep and far more effective than the Sixers. We may be the 2nd best team in the East, but we are definitely not 1st. Correct, but one reason Leonard is so successful shutting down Simmons is because Simmons refuses to work on his jump shot to make himself harder to defend and his passivity on offense in response to being shut down. He needs to be more focused on developing his game and aggressive going to the basket - he had 0 free throws last night and only attempted less than 10 shots total. That is unacceptable vs a good team like Toronto. Simmons needs to be one of our best players in these games. Hopefully he and Brown can work it out.